If your living room carpet is now resembling some sort of badly coloured fabric mosaic then maybe it is time to call in the cleaning professionals. Our carpet cleaning is one of the most intense and efficient upholstery cleaning services you will every benefit from and our carpet cleaners bring very strong and effective solutions to your home to help you get rid of the stains that have been plaguing you. 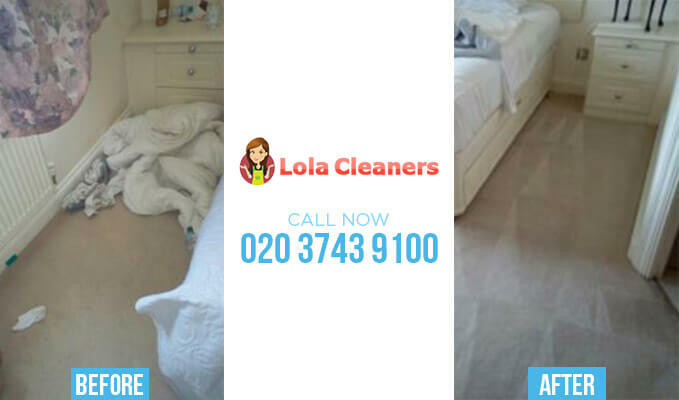 Contact Lola Cleaners on 020 3743 9100 to get the very best carpet and rug cleaners in the region and let us work our magic! Carpets tend to become a little discoloured over time and they don’t have to be exposed to the ills of the world such as Bolognese sauce, red wine or vinegar to be spoiled. If however you have encountered some of those problems you can always call us for deep heat cleaning in your home with the most powerful cleaning machinery in the business. Contact our team on 020 3743 9100 and we’ll swing by your address to give you the very best carpet and steam cleaning solutions you could possibly book in the region and all for a very low price. Cleaning services are not as cheap as they used to be and for specialist services such as carpet cleaning, it’s even worse. However our carpet cleaners have set to buck that trend. Rug cleaning is certainly specialist cleaning work but with the talents of our cleaning staff, it doesn’t have to take an age to complete and for a reasonable and very competitive fee, you could have carpet cleaners booked for a drop in the ocean and come out of it with an immaculate and very fresh living room carpet. We can clean any carpet in any room and always calculate our fee on a time basis, rather than give you a fixed fee per room which may prejudice those with smaller carpet areas in need of cleaning. Many people fear that they will have to take time out of work to get their carpet clean, even if they use a company like ours with efficient and handy cleaners who will get it right in a jiffy. That isn’t the case as our cleaners work a flexible shift pattern which enables us to get our carpet cleaner to you whenever it suits you best. If you need us first thing on a Sunday morning or late on a Friday night, we’ll have cleaning staff on hand to deal with you and will be able to bring all the materials and solvents we need to your home to give you a full carpet steam cleaning service. Lola Cleaners gives you the best and most intensive cleaning experience you will ever encounter and we are able to help with a range of carpet cleaning issues. We deal with intense stains and marks, and general discolouring and the depressions caused by footfall. We won’t take the carpets up either, our cleaners can use their machinery and apply extraction techniques to move the stains so the carpets won’t have to. Our carpet cleaning team have the ability to tackle the most gruelling of stains and remove them from your sight. If you would like to be given a free quote for our carpet cleaners on a no-obligation basis, then call us on 020 3743 9100 and we will tell you just how little it will cost for you to have your carpets fully cleaned and in the time that you want it doing. Our cleaners are trained, very experienced and very professional, donning uniforms and all the correct cleaning gear, and the job we do is extremely thorough.